Q: In these times, it is difficult to choose between the upholders of traditional misogyny and those whom you call the “Stalinists in skirts.”4 You walk a tightrope. But suppose people want to follow you on this road to nowhere. How can they do it if they aren’t funambulists? A: A little more than ten years ago, I wrote: “I don’t know where I am going, but I know what I despise.” On this point I absolutely haven’t changed. In these conditions, it isn’t surprising that I have as much scorn for the upholders of traditional misogyny as I do for the Stalinists in skirts, because both of them confine women into roles, even if these roles seem contradictory. The historical misfortune of femininity has precisely been having been confined in the straightjacket of roles. True feminine revolt consists in deserting the roles that the affirmation of a feminine specificity has justified. And so it happens that the selfproclaimed feminists of today, by frantically aligning themselves with that very feminine specificity, are beginning to once again lock femininity up in the prison of these roles, but this time under the pretext of liberation. A strange liberation, a new one that does not allow women to become what people have always refused to let them be: individuals. Escribio grandes letras donde critica el amoldamiento de personas como policias, banqueros, criticos de prensa y otros a modelos casi automatas llamandolos cerdos. Revindica la posicion de la mujer con una total liberacion y autonomia sobre su cuerpo. militante contra el maltrato anima. Cantante de la banda anarquista CRASS. 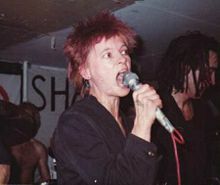 Autora de canciones como "shaved women" (mujer depilada), anarco feminista del movivmiento punk. Ver trabajo ideologico en canciones de crass!!! Banda de punk en colombia, las liricas muestran una fuerte linea anarco punk. 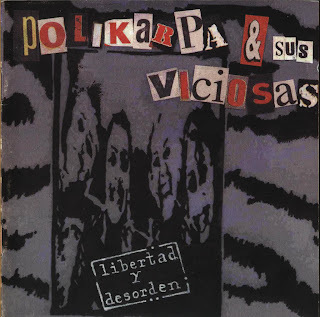 La fuerza del punk femenino!! !